"For me, it was better to kill them before. When the lion wants meat, he has to kill." - Robert Cheruyiot describing why he pushed the pace early in Boston instead of possibly waiting for others to fall off in the hills. Monday is Patriot's Day in Boston and that means one thing, the running of the Boston Marathon. We break down the men's field which is incredibly weak with the withdrawal of Chicago Champ Patrick Ivuti. (Fortunately, Boston is showing signs of entering the 21st century as it is increasing its prize pool 38% and allowing corporate signs at the start and finish for the first time). 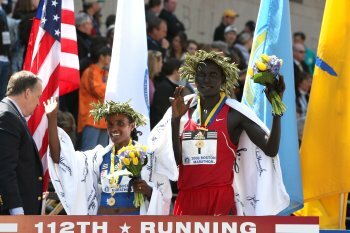 The race is the incredible Robert Cheruiyot's to lose. Will he come out on top or will a new star emerge?. On the women's side, there are a host of women who could come out on top but we believe Jelena Prokopcuka is the class of the field. And believe it or not, this year's Boston will be the first one we'll see in person. 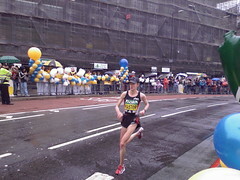 While Boston may have dropped off a bit in terms of quality, it's always been perhaps our favorite marathon because it has for as long as we can remember had LIVE national television (Versus network this year, also available on the web for free on WCSN.com).And from a spectators standpoint, television is the best way to watch a marathon. *Clemson Track Coaches Get off on Embezzlement Charges They put $27,000 into a personal account. John McDonnell To Retire At Season's End The greatest track coach in NCAA history and one of the greatest coaches period is calling it a career after 42 national titles and 83 conference titles, including 34 straight in cross country. * Pick 3 Marathon Runners To Represent Kenya in Beijing? 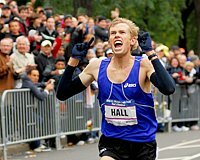 *Would Ryan Hall have won the Boston Marathon? *Hall and Boston Billy We love Boston Billy but laughed when we read this post: " Sometimes all Billy had to do to get a major victory was beat Jerome Drayton of Colorado or Kirk Pfeffer of Colorado. That's hardly the same as having to beat Martin Lel." *How Much Bigger Was the Crowd In Boston than NY? *How di Mike HUCKABEE do at Boston? Further Proof Everyone Comes to LetsRun to Find Out What is Going On in Track and Field Guardian Newspaper in London Prints Story Based on Unsourced Letter Smashing John Smith over Mo Greene Scandal The letter appeared on our message boards and was removed.